(NASHVILLE, Tenn.) May 3, 2013-Nashville's own five-time GRAMMY nominated, singer/ songwriter Brandon Heath along with highly-acclaimed songwriter and Dove-winning Producer of the Year, Jason Ingram will once again hold their annual "Love Your Neighbor" benefit show to raise funds for a specific need in the local community. Hosted by Fellowship Bible Church in Brentwood, Tenn., this year's event will be Tuesday, May 28, at 7 p.m. Donations will be collected during the free show and all proceeds will go to New Hope Academy, a privately-funded pre-Kindergarten thru sixth grade school in Franklin, Tenn., which exists to serve low-income families with free tuition for its classical education. Six-time GRAMMY Award winning artist TobyMac and three-time GRAMMY nominated Mandisa will both perform at the event, along with Heath and Ingram, providing a rare opportunity for all four artists to share the stage throughout the night. Heath and Ingram created "Love Your Neighbor" in May 2008, and the annual event has raised more than $140,000 for Nashville and surrounding area needs. As demonstrated by Heath's involvement with "Love Your Neighbor," his new single which released to radio recently, "Love Does," carries a message of love in action. Heath wrote the song to celebrate his mentor, Bob Goff who authored a book with the same name. Heath explains, "Love is action, it literally transforms people. If we are not in the action of loving on a daily basis, and learning what love is and isn't in those actions, then I think we are missing out on what life is." For more information on "Love Your Neighbor," follow the event's twitter @luvyourneighbor and Facebook page: www.facebook.com/LoveYourNeighbor. To find out more about, or to donate to New Hope Academy, please visit www.nhafranklin.org/. About "Love Your Neighbor:" The "Love Your Neighbor" event is an annual free benefit concert, born out of the hearts of Christian music leaders Brandon Heath and Jason Ingram, to support local needs within the Nashville and surrounding communities. Over the last five years, a variety of beneficiaries have been helped by the show. In 2008, $20,000 was raised for Nashville area tornado victims. In 2009, David, a local Centennial High School student, lost his father, his health insurance, and was at risk of losing his vision without access to a necessary eye surgery. "Love Your Neighbor" covered the total cost of the medical attention David needed and his vision was restored. In 2010, more than $61,000 was collected for El Shaddai Church in south Nashville that was severely damaged by flooding. In 2011, the gathering raised more than $25,000 for the Lee family who was affected by the devastating tornadoes in Alabama. Last year's event raised more than $14,000 for Young Life Capernaum, an outreach for students with physical and mental disabilities. About New Hope Academy: With a mission to empower the poor, New Hope Academy is a Christ-centered community school, located in Franklin, Tenn., with an economically, racially, and culturally diverse student body. It exists to serve low-income families by establishing a solid Biblical worldview, instilling vision, confirming hope and preparing each young person for a life of service. New Hope Academy is dedicated to a unique educational experience, equipping children from all backgrounds to become a generation of leaders. New Hope reserves 40-50% of its seats for low-income families. Those families receive full tuition, a value of $9,250 per year, raised through donations. Approximately one-third of New Hope's students live in single-parent households. The rest of the student body is comprised of partial-pay or full-pay students. Ten countries are represented, and a number of first-generation Americans sit in its classrooms. For more, please visit, www.nhafranklin.org. 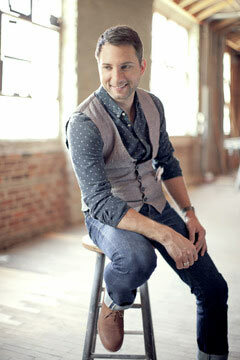 About Brandon Heath: Since Brandon Heath's debut on Reunion Records with Don't Get Comfortable (2006), he has become one of Christian music's most beloved and respected artists and songwriters. Heath has twice been honored as GMA Male Vocalist of the Year (2009 and 2010), additionally garnering an Emmy Award, five GRAMMY nominations, an American Music Award nomination and multiple GMA Dove Awards and songwriting honors. His award-winning songs and signature vocals reflect a soaring radio career that includes four No. 1 hits: "I'm Not Who I Was," "Wait and See," the 2009 GMA Dove Award-winning Song of the Year, "Give Me Your Eyes" and the eight-week chart topper, "Your Love." About Jason Ingram: Jason Ingram has one of the most diverse and accomplished resumes in Christian music. Over the last few years, Ingram has become one of Christian music's most successful and respected songwriters and producers with album and songwriting credits for work with artists including Building 429, Tenth Avenue North, Chris Tomlin, Sanctus Real, Meredith Andrews, Mikeschair, Paul Baloche, Brenton Brown, Jason Gray and Bebo Norman, among others. A prolific lyricist, Ingram's songwriting credits include, Brandon Heath's "Give Me Your Eyes," Hillsong and One Sonic Society's "Forever Reign," Sanctus Real's "Lead Me," Chris Tomlin's "I Will Follow," Matt Maher's "Alive Again," Chris Tomlin's "White Flag," and Tenth Avenue North songs, "You Are More" and "By Your Side." The latter was named Song of the Year at the 41st Annual GMA Dove Awards and was the No. 3 played Christian song of the decade (2000-2010) according to Billboard Magazine. Ingram also picked up the Producer of the Year Dove Award, was Billboard Magazine's 2009, 2010, 2011 Christian Songwriter of the Year and is a three-time GRAMMY nominee for Best Contemporary Christian Music Song ("Give Me Your Eyes," "Your Love" and "White Flag."). Further, Ingram is co-writer of back-to-back GMA Dove Award-winning Songs-of-the-Year (2009's "Give Me Your Eyes" by Brandon Heath and 2010's "By Your Side" recorded by Tenth Avenue North), SESAC's Co-writer of The Year for the last two years (for contributing to "Give Me Your Eyes" and "By Your Side") and recently received his seventh consecutive SESAC Christian Music Award for Songwriter of the Year. About TobyMac: With over 11 million units in career sales, TobyMac's career continues on the fast track. His most recent project, EYE ON IT, garnered him the highest chart debut of his solo career landing at No. 1 on the Billboard Top 200 and topping the iTunes Overall and Christian sales charts. The project made TobyMac one of only four artists to ever debut atop the Billboard 200 with a Christian music album. Earlier this year, EYE ON IT received a GRAMMY, marking the sixth career award for TobyMac. The music video for the album title's track, featuring pop-sensation Britt Nicole, received over 500,000 views in its first three weeks. His previous four solo projects have received RIAA Gold certification and his live DVD, Alive & Transported, is certified platinum by the RIAA and received a GRAMMY award. TobyMac won his first American Music Award for Favorite Artist in the Contemporary/Inspirational category last year and also swept the 2013 Australian Music Awards. His 2009 album Tonight received GRAMMY nods for Best Pop/Contemporary Gospel Album and Best Contemporary Christian Song. TobyMac recently wrapped his headlining slot on the 2013 Winter Jam Tour. About Mandisa: Three-time GRAMMY nominee Mandisa's discography includes True Beauty, It's Christmas, Freedom, What If We Were Real and her remix EP, Get Movin' on Sparrow Records. This past fall she performed her hit single "Good Morning" on the highest rated morning show, ABC's "Good Morning America" and returned to the show in February to perform "Stronger" for the return of Robin Roberts to the show. The Season 5 American Idol finalist is also an author with the release of "Idoleyes: My New Perspective on Faith, Fat & Fame." Mandisa was one of several Idols selected to open Walt Disney World's American Idol Experience in early 2009. With nearly 800,000 albums sold, Mandisa's music and message continues to connect with fans. Her album, What If We Were Real, is her fastest selling album ever, tracking 80% ahead of her previous album and has sold over 230,000 units to date. The album features the breakout radio hits "Good Morning," "Waiting For Tomorrow," and the No. 1 AC single, "Stronger." With widespread media coverage including The Today Show, LIVE! With Regis and Kelly, E!, Extra, Entertainment Tonight, US Magazine, People Magazine and CNN, this American Idol alum and three-time GRAMMY nominee continues to be a voice of encouragement and truth to women facing life's challenges.